It’s Poison Prevention Week, so we’re going to be looking at pet poisons found around the home. Some you would expect, others may surprise you. 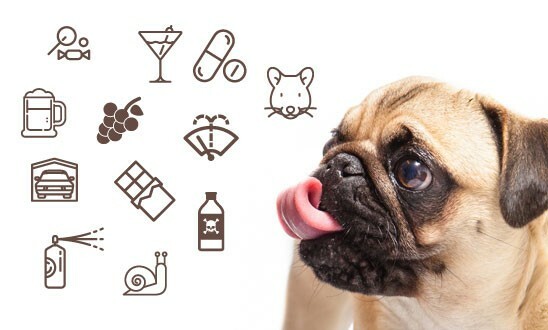 In this article, we’re listing some of the more common poisons that affect dogs. Below is our roundup of the ten most common dog poisons. The most common cause of poisoning in dogs is chocolate. Chocolate contains a compound called theobromine which is toxic to dogs. Most dogs enjoy the sweet taste of chocolate, so will happily consume a potentially dangerous amount. Dark chocolate is a bigger hazard than milk chocolate, as it contains more theobromine per gram. You can use our chocolate toxicity calculator if you think your dog has eaten chocolate. Read more about chocolate toxicity. 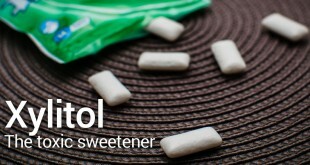 Xylitol is a sugar-free sweetener that is becoming increasingly popular. It can help prevent cavities, meaning it has become widely used in dental health products and chewing gum. As it is non-toxic to humans, it has been incorporated in to many foods, treats, vitamins and even medications. Xylitol is rapidly absorbed in the canine gastrointestinal tract. It causes a release of insulin that can lead to hypoglycemia, liver damage or even death. There is little evidence suggesting xylitol is as toxic to cats. Common symptoms of xylitol poisoning are vomiting, lethargy, and weakness. The outcome is usually good for dogs that are treated quickly for hypoglycemia. Rodenticides used to kill rats and mice are often found in garages, sheds or outhouses. Although these poisons are bitter, an intrigued dog may still consume the bait. Bait stations that have been visited recently by a rat or mouse could increase interest from a dog. Rodenticides are anticoagulants that can cause internal bleeding or haemorrhaging. Symptoms can be vague at first (lethargy, weakness), but can progress due to internal bleeding. Treatment requires a daily dose of Vitamin K over one or more weeks, given by a veterinarian. Pain relief for humans usually starts with ibuprofen, paracetamol or aspirin. These pain killers are known as non-steroidal anti-inflammatory drugs. Poisoning often occurs accidentally, when an owner gives NSAIDs as pain relief. Dogs do not react in the same way humans do to these drugs. Although they are sometimes prescribed by veterinarians, they are specifically formulated and dosed for the patient. Pet owners should never give their pets any medication without first consulting with a veterinarian. An overdose of NSAIDs can cause stomach ulcers, vomiting, diarrhoea, weakness, lethargy, kidney failure, liver failure and neurological problems. 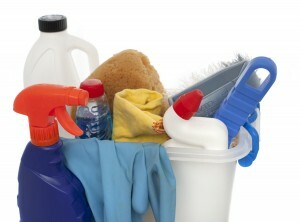 We use a wide variety of cleaning products daily in our homes. There is a lot of potential for pets to accidentally consume some of these toxic chemicals. Cleaning products should not be accessible to pets and pets should be removed from the room they are being used in. Be wary of any spills or if products need to be left out to work. The US Pet Poison Helpline has noticed a trend in laundry capsule poisoning. These colourful pods are highly concentrated and attractively coloured and scented. A huge range of medications are now prescribed to humans, each with separate risks both to human patients and pets. It’s important that medications are kept out of reach of children and pets to avoid accidental consumption. Be aware of medications or supplements that may be stored in handbags, which are easily accessible for dogs. Anti-depressant toxicity is one of the most reported medication poisons. Depending on the dose consumed a variety of symptoms can occur, such as lethargy, sedation, agitation, tremors, fever, vomiting, irregular heartbeat, panting, and seizures. It often comes as a surprise that these seemingly innocent fruits could be toxic. Grapes and raisins can cause kidney failure in dogs, but the how and why is still unknown. Even the amounts needed to cause toxicity are subject to debate. Vomiting and diarrhoea are the first signs of toxicity in dogs, which can develop to kidney failure in 48 hours. One study has estimated that 3g or more per kg body weight could be a toxic dose. Induced vomiting is recommended if the grapes or raisins were eaten in the past two hours. Dialysis may be required in more severe cases. Most pet owners know that pets shouldn’t be given alcohol. Alcohol reacts much faster in a dog than human. This is partly due to their size, but also their lesser ability to process alcohol in the liver. It can be quite easy for a dog to accidentally consume alcohol. Most often, spilled beverages are to blame, but alcohol can be found in other places. Fermenting fruit found on the ground or yeast in dough can lead to accidental alcohol consumption. Some dogs have even experienced alcohol toxicity through contact with their skin! Ethanol toxicosis occurs when a dog consumes too much alcohol. Symptoms of toxicosis include vomiting and diarrhea. In more in more sever cases coma, kidney failure, or even heart failure can occur. Antifreeze contains the toxic chemical ethylene glycol. Antifreeze tastes sweet and is often brightly coloured, making it appealing to your dog. It can often be found beneath parked cars, where it has leaked or spilled. Spillages should be cleaned up and heavily diluted. Antifreeze poisoning requires treatment with an antidote within a 12 hour time-frame. Initial symptoms are similar to ethanol toxicosis. After 24 hours, severe acute kidney failure occurs which is fatal without treatment. Slug pellets contain a compound called metaldehyde. Slug pellets are vibrant and sweet tasting, making them a risk for accidental ingestion. Anything from 50 to 500g of a typical 4% metaldehyde pesticide can be fatal in dogs. If the ingested amount is smaller; vomiting, diarrhoea, increased heart rate/body temperature, salivation, unconsciousness and liver damage may occur. This list of dog poisons was put together from the top dog toxins reported to the Pet Poison Helpline. Unfortunately, there are many more dog poisons that can be found around the home and garden. A full list of dog poisons can be found here. In any incidence of poisoning, timing is critical. Do not delay in seeking veterinary advice. In most cases, inducing vomiting can help if the toxin was ingested in the last two hours. After this, vomiting will not help remove the toxin. Treatment varies depending on the type of poison your dog has ingested. Prevention is the best option, so try to keep potential poisons out of reach. 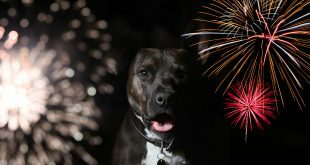 Previous Can Excitement Boost Your Dog’s Training Sessions? My 14 month labradoodle has had chronic gastritis for 6 months. At the beginning he also had joint stiffening so the vet put him on Hills zd. He still vomits yellow bile a couple of times a week. Do you have any suggestions. Antifreeze kidney failure is fatal even with treatment. We learned this the hard way. Our dog was not seen licking a puddle of antifreeze (which the experienced emergency vet said was the only instance she has ever heard of one dog surviving because they were seen, and the antidote given immediately). Once we noticed symptoms, it was already too late. We tried absolutely everything and would have done dialysis or a transplant to save our girl had they been recommended. Once your dog shows symptoms, the antifreeze has already metabolized and you have passed the window of the antidote. After this, kidney failure will kill your dog. Of course we did treat regardless, we wanted to exhaust all options, but it just prolonged the inevitable and she was put out of her misery on March 7th. Sorry to hear about your loss Kat. Your comment really shows how important it is to get to your vet quickly if you notice they’ve consumed something toxic. Thank you, James. This is absolutely true. If you have even an inkling something is wrong with your pet, please do not hesitate for one second. I’d rather be out the money for the vet than the alternative.